Manilow Madness aside, I did my best to be the manly son my father wanted. I joined the Cub Scouts. I played Little League and flag football. And the thing is I liked it. I wasn’t a mama’s boy by nature, I was a mama’s boy by nurture. My folks got off to a rough start. They dropped out of high school, married young, had three kids. By the time I was ready for preschool, they’d determined that raising a family of five on a repairman’s salary wasn’t going to cut it. My father went back to school – a four year degree in two and one-half years – and worked full-time. He even took on some side work, too. Which is simply to say that from my earliest childhood memories, my dad was a very busy man and my mother and my sisters were my full-time family. It was a girls’ house. They were very involved in Girl Scouts, so I tagged along to meetings, day camps, and whatever else the Girl Scouts were doing. I made God’s eyes with yarn and popsicle sticks, and weaved placemats from cattail leaves. I learned campfire songs. But my father, he was the measure of a man. He was what I wanted to be. I just didn’t know how, and he didn’t have the time to show me. I’d never been in a fight before we moved to Chicago. Within a month of moving, I’d been in at least six. Every boy in our new neighborhood had to fight before they could be friends. I learned this when Bobby Cruz jumped me at the bus stop, sat on my chest and pounded me in the face. All the other boys circled and watched. “Break it up.” Bobby kept punching me in the face. The next day we were buddies. Six fights, or more specifically six instances of me coming home bloodied and sobbing, was my mother’s limit. “I wish you’d toughen up,” she said, and she wiped the blood from my nose with a warm washcloth. I didn’t know how to toughen up, and I felt like I’d lost my only ally. Baseball was another problem. It was the de facto sport of the neighborhood. I couldn’t throw, couldn’t catch, couldn’t hit. I didn’t even know the basic rules. My father worked third shift. He didn’t have time to teach me to fight or play baseball. He just didn’t have time. Enter the big kids. There were three categories of kid in our suburban neighborhood: too small to play baseball; too old to play baseball; and somewhere in the neighborhood right now playing baseball. The kids who were too old to play wore their hair long and only came out at night. They’d huddle beneath a street light and smoke cigarettes. They were the older brothers and sisters of my friends, but I never saw them when I’d go to their houses to play. They were like vampires. Except for Johnny, my next door neighbor. Tall, handsome, cocky, a 13 year old legend in the neighborhood. Johnny was an all-star pitcher, the one big kid who hadn’t turned his back on baseball when he hit junior high. He called himself “The Kid,” and he was nice to me. Granted, taking me under his all-star wing was a way to get close to my big sister, but nevertheless he was nice to me. Johnny taught me to throw, catch, and hit. He explained how the game worked and encouraged me. Before long I was out in the street with the other kids, playing pick up games. Johnny would never play, but now and then he’d take a couple of swings just to impress us. He could hit the ball twice as far as any of us. One Saturday my father took me out in the driveway for a game of catch. I couldn’t believe my luck – finally a chance to show the old man my skills. The ball popped right into my glove’s pocket, and I got it back to him in the air and somewhat on target. Back and forth went the ball. Back and forth went my adoration for The Kid. The more I talked, the harder my father threw. I could hear the ball hiss before it hit my glove. My hand was stinging. Finally he burned one in so hard that I took off my glove and held my reddened hand. My eyes watered up. “Can Johnny throw like that?” he said. The game was over. Not long after that I visited my friend Eric’s house. It was dirty and it smelled funny. We traded baseball cards, played vibrating football, and then sunk into general boredom. “We could listen to records,” he said. I liked that idea. Eric broke out the usual suspects – John Denver, Neil Diamond, The Monkees. “Last Train to Clarksville” was pretty cool. He played The Jackson Five’s “Rockin Robin” back to back with Silver Convention’s “Fly Robin Fly,” which started a lively (for eight year olds) discussion about why robins make for good lyrics. “My older brother has a record with a talking guitar on it,” Eric said. He came back with Frampton Comes Alive! tucked under his arm. It was the coolest thing I’d ever seen. 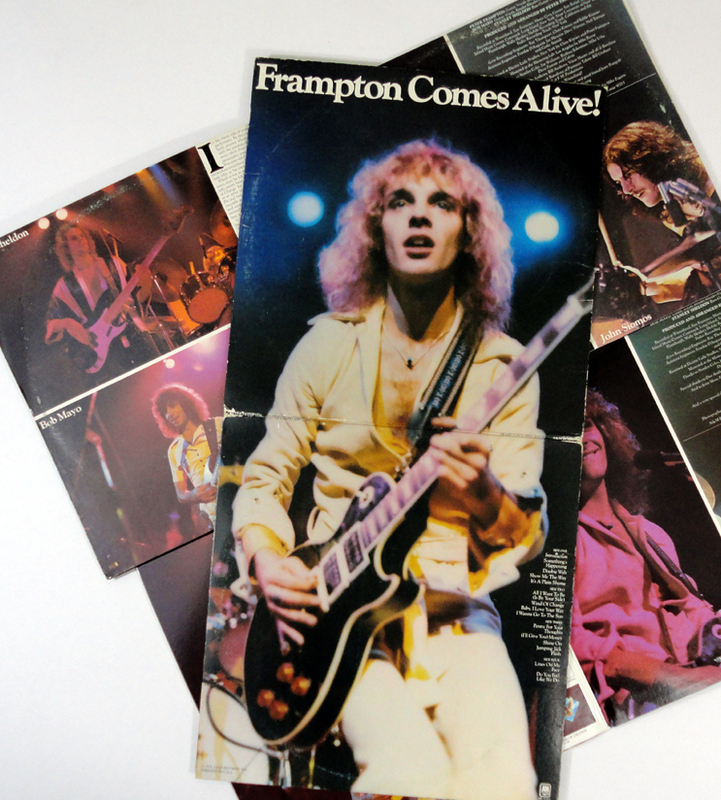 A double album, the gatefold sleeve opened to a full length photo of Frampton. His long blond hair was glowing purple in the stage lights, his eyes were fixed on the heavens. And strapped across his scrawny chest was the alleged talking guitar. He looked like one of the big kids who hung out under the street lights, but his expression conveyed The Kid’s kindness. This was big people music. This was music for hanging out under street lights. I felt ten times cooler just listening to it. It felt like I was committing a crime or something, like any minute my mother was going to walk in and demand to know why I was listening to this deranged story about champagne for breakfast and friends who had been arrested. That was it. That was the big difference. I didn’t know that music was performed live, that it was interactive. Before that it was a monologue, not a dialogue. Lee Dorsey told me about his Ya-Ya; Elton described the Yellow Brick Road, and I listened while they talked to me. But Frampton broke the wall – he asked me to participate. I wanted to be there. I wanted to be anywhere where a band was playing and I could be a part of the screaming crowd. But I was eight, it wasn’t going to happen. I couldn’t wait to be a big kid like Johnny, or even better like one of those mysterious long-haired kids who lurked in the shadows of our neighborhood. Needless to say, Eric was right. The guitar talked. My little brain was completely blown. I stared at the album cover, looking for some sign of life in that black guitar. It was some kind of miracle. I quit the Cub Scouts after that, and I refused to get my haircut. My father was around less and less, but it was okay. I had the big kids now to show me the way. i think my first live album was Bob Seger and the Silver Bullet Band. But my stepdad listened to alot of lynyrd skynyrd on cassette tape. I will always associate those two bands with beer cans and the smell of pot. I think Live Bullet was originally packaged with a beer can full of pot smoke. The live version of “Turn the Page” on that album is brilliant, not a bad first album for a young pup. The interactions between you and your father…………..